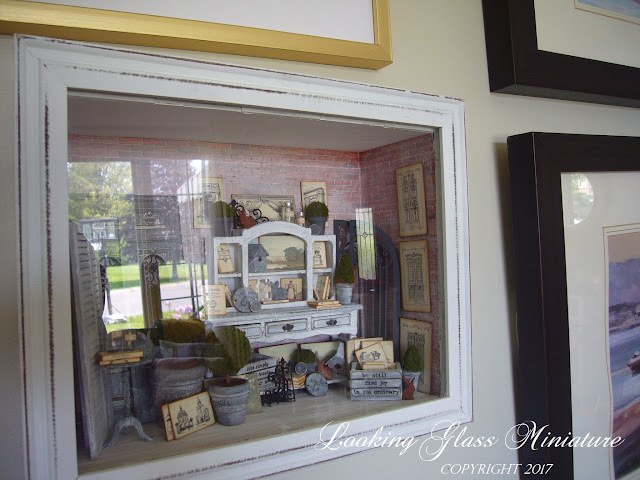 Showcasing my French Antiques Shadowbox. as one of their Guest Designers. I chose the new Large Frame Shadowbox to decorate. 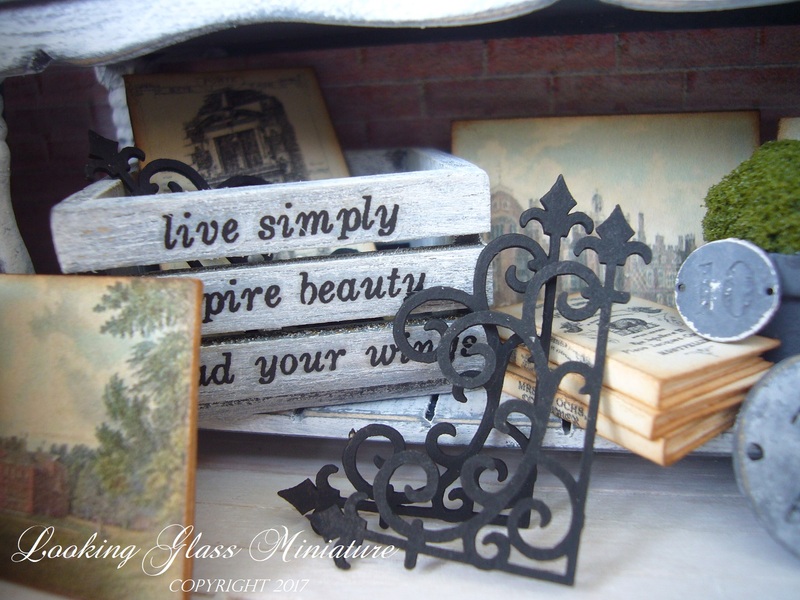 I love the depth to this shadowbox as it allows such flexibility in your design. 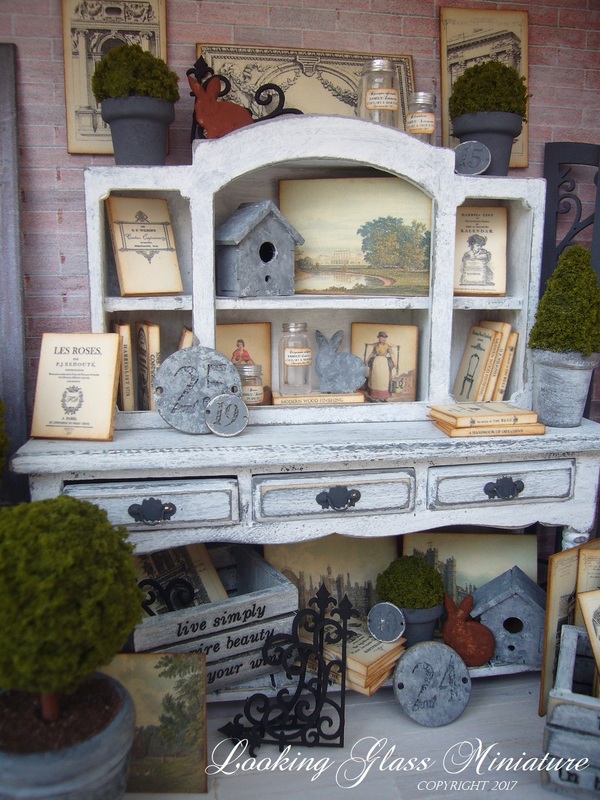 Imagine that you have just stumbled across a wonderful french shop filled with lovely antiques. I was also able to design a collage sheet to accompany this display, which I incorporated into the display. Vintage Prints & Architectural Drawings Collage Sheet. The 3-Panel Hutch was cut in half to fit on top of of the wooden side table. Faux Metal Number Plates 1 to 25 are just one of the-items displayed on the bottom shelf of the 3-Drawer Unfinished Wooden Side Table. I used acrylic grey and white paint to give the numbers a vintage zinc look. The technique I use for this is to paint the item a dark grey and then proceed, when it has dried, to apply a lighter grey and some white-washing with a slightly dry brush. You just keep applying paint until you are satisfied with your look. 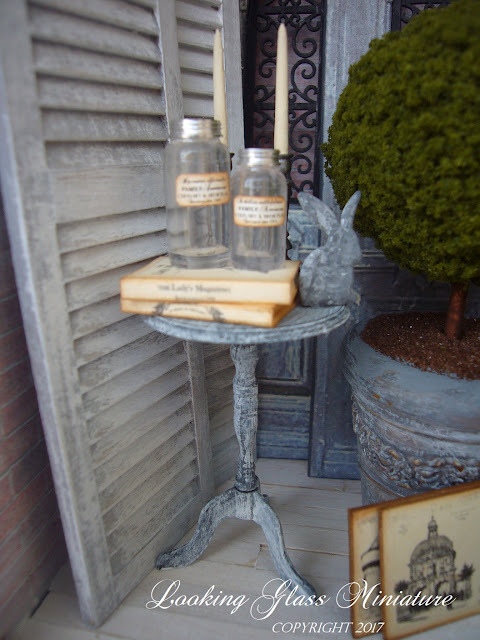 I used Candlestick Table Kit – Black and decorated it with the following items: Mason Jars set of 3, Pewter Candlesticks, Rabbit Brads and the Vintage Books I designed for the collage Sheet. I applied the same technique to distress the table and rabbit brad with acrylic paint. 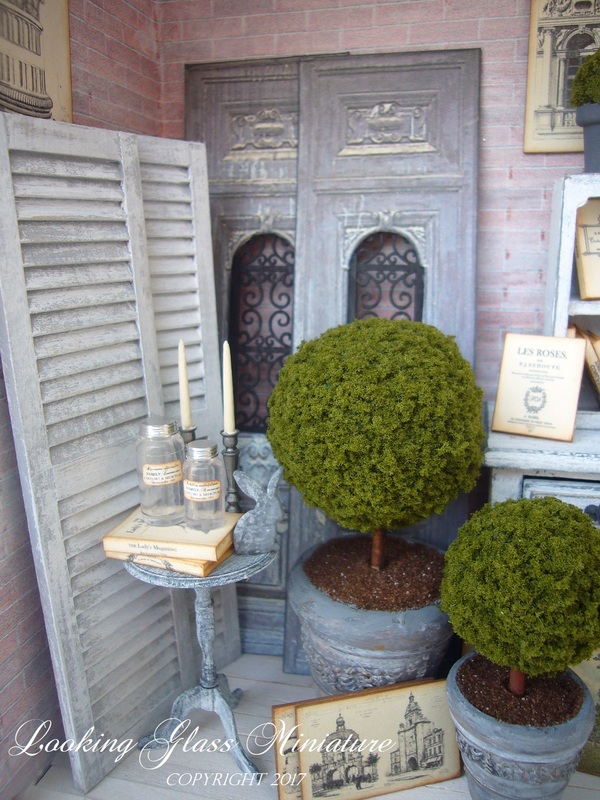 The topiaries in this picture were designed by using the following materials: Leafy Green Underbrush, Antiqued Large Victorian Planter, Antiqued Medium Victorian Planter, Leafy Green Underbrush, Bamboo skewer,Styrofoam Balls 1” & 1.5”, Sandtastic Brown Coloured Sand, foam, & Acrylic Paint. These are very easy to make and only require a little patience. First step is to insert your Bamboo Skewer into your Styrofoam balls and paint with green acrylic paint. 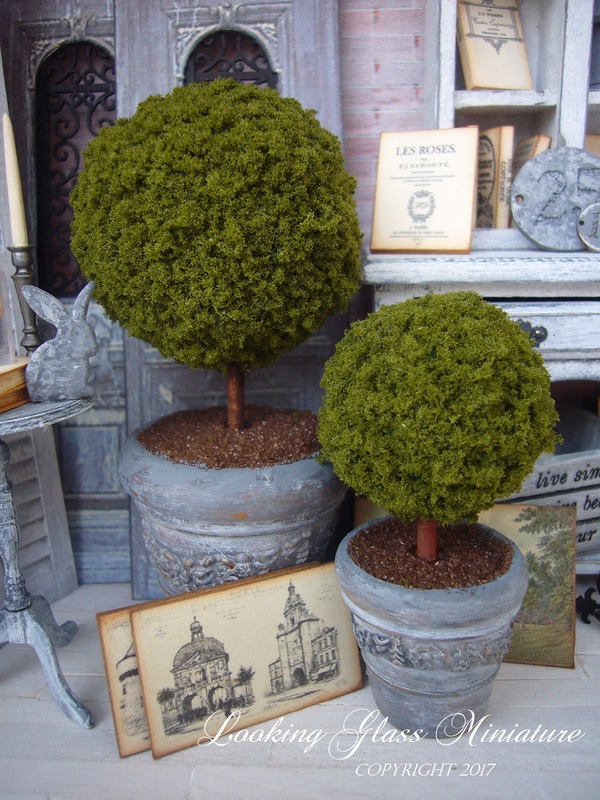 When dry,add white glue to your balls and sprinkle your Leafy Green Underbrush onto them. I used my hand to lightly push the material into the foam ball. This will ensure good contact. You can fill any spots you have missed when the glue has dried. I then take my scissors and give the topiary a trim to level out the areas.Cut foam to fit inside your planter add glue into base and sprinkle your sand to mimic dirt. Once this has dried, trim your skewer to size desired, paint it and insert into the foam of your planter. The Wrought Iron Gates in this photo are so beautiful. I love the old world look they have. They are sturdy and stand up well on their own. A perfect find for someone shopping in my Miniature Vintage Shop. Vintage Architectural prints are displayed on the walls. 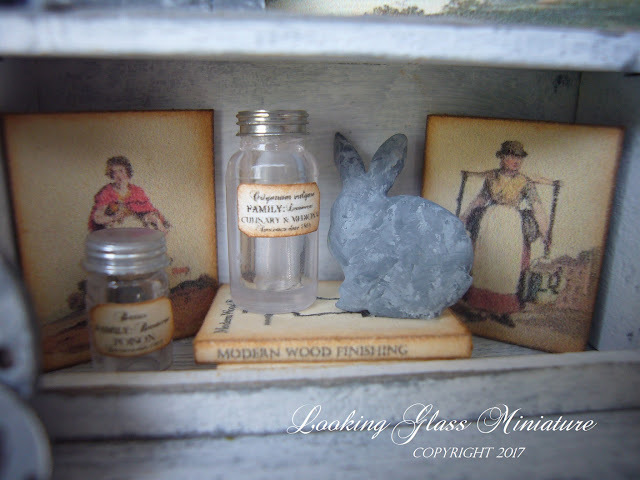 The miniature resin planters have been painted with acrylic paint to look as though they are zinc. I shaped the foam in them to look like a tall cone and then covered it with Leafy Green Underbrush. 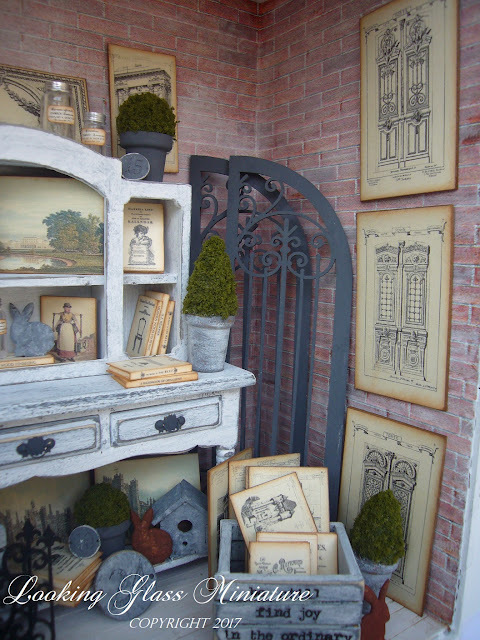 More Vintage Architectural Prints and Vintage Books are displayed in the wood crate. 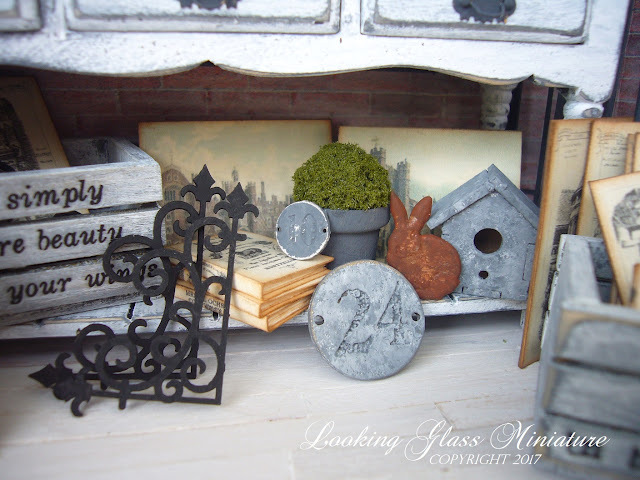 I love old crates and used the Tall Wooden Fruit Crate and Tim Holtz Rub-Ons (Botanical)to decorate it. You could use any Rub-on to your liking as I believe these might be discontinued. The Crate was also sanded down to remove its original layer of paint,I then repainted it to look worn. 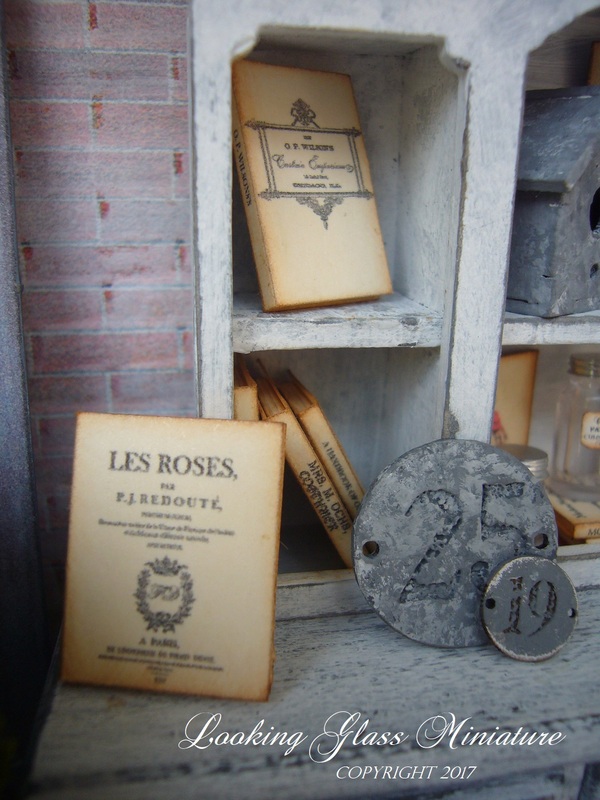 There are lots of great tutorials online about creating your own Rub-Ons with wax paper. Why not give it a try? Vintage books and Numbers on display. I love how these books turned out. They are so easy to make. 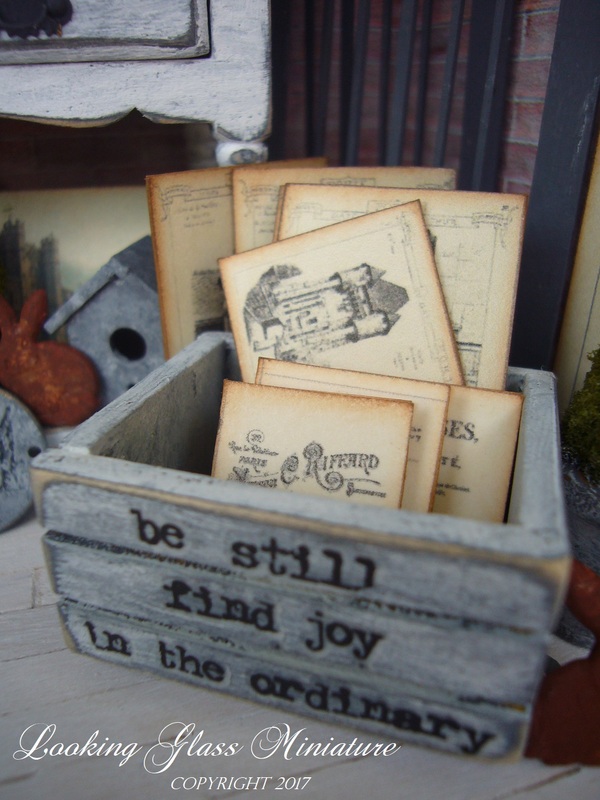 Just fold along the lines of the book and add in your choice of paper, foam, or wood. I used paper in mine. Rabbit Brads and Mason Jars decorate this shelf along with vintage prints and books. The Rabbit Brads are distressed with acrylic paint to look like zinc. All the Mason Jars have labels on them that are part of the Collage sheet I designed. These doors are one of my favorite things about this display. I used the Old Doors Collage Sheet to make them. 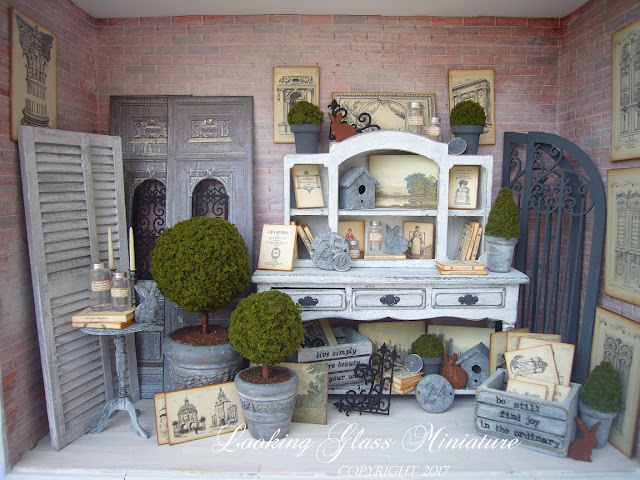 I re-sized them to fit my needs for this display and added Mini Chipboard Wrought Iron Flourishes Set components to give the door a more realistic look. 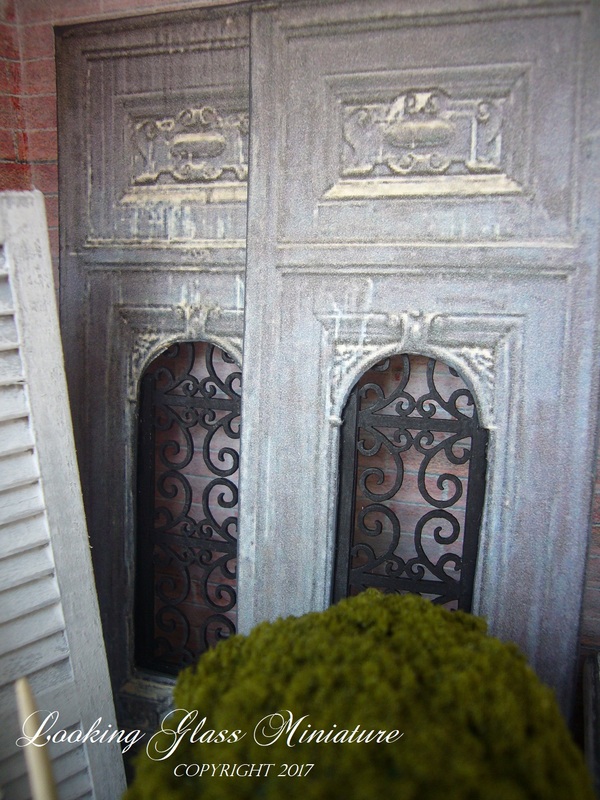 Shutters painted and distressed add to the worn feel to the display. Mini Chipboard Wrought Iron Flourishes Set components painted black to look like old iron. I love the look and feel of these. I thought I would show you how I cut the 3-Panel Hutch in half. I used a very sharp x-acto knife to cut the panel in half. 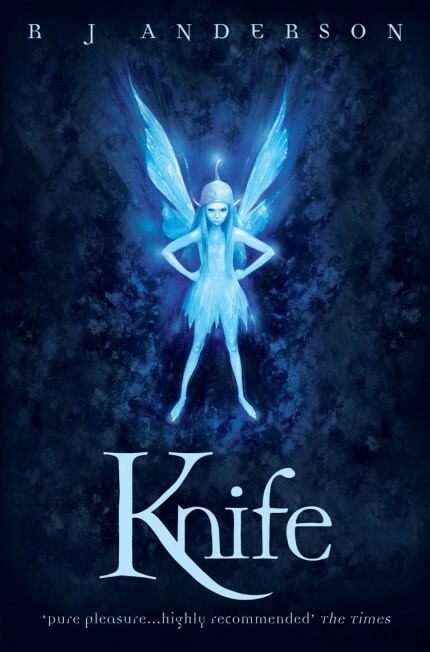 Use your ruler to guide your knife. This will allow you to get a more precise cut. Adding the above section before gluing also allowed me to determine exactly where I wished to cut the hutch. My first step in making the vintage doors was to re-size them to fit my display. I then added 12" x 12" Chipboard for backing and cut out the window section. Cutting up the Mini Chipboard Wrought Iron Flourishes Set into the straight the section you see in the photo. The top part of the section is what I will be using in the door. In the photo above I have taken the section and added cardstock to the sides of it. This allows me to attach it on the back of the door easier as there is more glue-able space. I have painted all of the pieces black before gluing them. Glue it into the back of the door. I wanted to have wood flooring and wished to have a slim profile on the wood. I was at our local dollar store and found these wood stir sticks. They worked fantastic, You will of course find lots of imperfections in such a product but you can cut off these sections and make different lengths of them. One of my last jobs was to print and back the Architectural prints with more of the 12" x 12" Chipboard. You will want to weight these down afterwards to keep them from bending. Once dried, cut them out and antique the edge with your ink pad. Below are the books that can be made with the Vintage Prints & Architectural Drawings Collage Sheet. Labels: Alpha Stamps, botanical prints, Closed Books, dollhouse roombox, French Miniature, miniature apothecary bottles, Miniature Topiary's. Gorgeous Jenn! Love the collage sheet you have designed. A lovely scene full of charm! Thanks so much, I had fun making it. What a creation of love this had to be! I am amazed at your talent. You truly love what you do and I can see you are an expert at it. I love the theme and every piece is done so well. Bravo and thank you for sharing -it has me thinking I just might have to start making miniatures. Thank you so much, I love minis as you have such freedom to create anything you wish. Impresionante escena,es de una gran belleza visual,con mucha profundidad y unos tonos perfectos,enhorabuena!!!!! 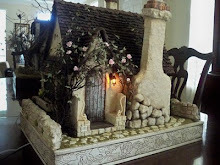 A very beautiful creation with many details. Congratulations on a true "Guest Designer" success! The feeling you've created with distressing techniques and and the creative reworking of the furnishings is lovely. And what a wonderful way to display your work! Hi Jodi, thanks so much for your comment. Hoping to do some more projects as I had such fun with this on. 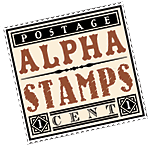 Alpha Stamps has been fantastic to work with. Well done! :D I will have to go back and find all the details I missed the first time. Lovely work!